Zarzuela is a Spanish style of Opera that can be divided into two general categories – Baroque or Early Zarzuela, and Romantic or Late Zarzuela. In the mid 17th century, writer Pedro Calderón del Barco and composer Juan Hidalgo de Polanco gave birth to a new style of theatrical performance: the Zarzuela, a perfomance partly spoken, often in poetic verse, partly sung in operatic style. Zarzuelas could be anything from serious stories, retelling of folk tales, or comedic slapstick productions, and enjoyed great popularity in Spain throughout the 17th and into part of the 18th century. However, in the 18th century Italian artists began influencing most art forms across the Mediterranean. A tastes trended towards the more Italian standard operatic style, the age of Zarzuela’s popularity seemed at an end. Zarzuela performances ebbed for nearly a century. Then, in the 19th century, after what was deemed the Glorious Revolution of 1868, the country fell on hard times. This of course was reflected in the theater. As the public could not afford high priced entertainment, short one act plays with low budgets became popular quickly, and the Zarzuela adapted immediately to the cultural shift. This is how Zarzuela grew back into prominence. 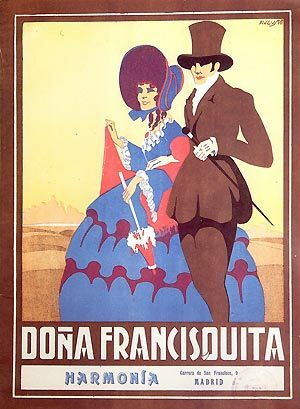 There were two types of Zarzuela’s in this ‘Romantic Age’ of the tradition, the chico – which were generally one act, often salubrious or farcial productions, but cheap – and the grande – which were longer more traditional operatic productions. The Zarzuela tradition grew back and remained into the 20th century and even began to take on an Operetta like quality to some of them, such as one of the most popular Zarzuelas, El Barberillo de Lavapiés, both light in humor and action, but bold in its social criticism.